"What makes our dusters so irresistible?" Never before has there been so much interest in our exciting range of Ostrich Dusters, Infact we now boast the largest range in the United Kingdom if not Europe! 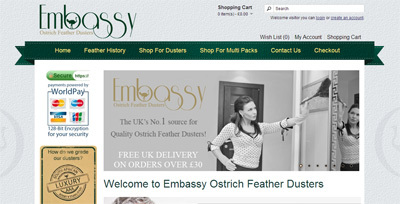 Our Beautifully hand made traditional Ostrich Dusters really are the very best money can buy. Our Butlers Choice Range has found a huge following from delighted customers who have recommended our Dusters to friends and family and to whom we are for ever grateful. We go to great lengths and a lot of effort to ensure all of our Dusters are perfect in every detail from the outstanding quality of our feathers to the packaging for delivery.we believe you will be 100% delighted with your Duster whether it be the outstanding quality of our Butlers Choice Ultra floss Range or our sensually soft South African black Range, "you can be sure of one thing" Our Dusters will make light work of the daunting task of dusting, freeing up more of your time to spend as you like."